Most years, we put up two Christmas trees. One upstairs that is covered in handmade and colorful ornaments, and one downstairs that is "Momma's tree." Only the ornaments that match the theme go on Momma's tree. Most years, though, we do not have 100 chickens to care for in an ice storm. So, this year, we have one tree. It is downstairs and is the place where Momma's tree meets up with a smattering of the kids' favorite ornaments. I could take a picture of what it looks like in the daylight, but let's be honest, what matters most is what it looks like in the early morning when you're curled up on the sofa, warming your hands with your coffee mug, and gazing at its many twinkling lights. 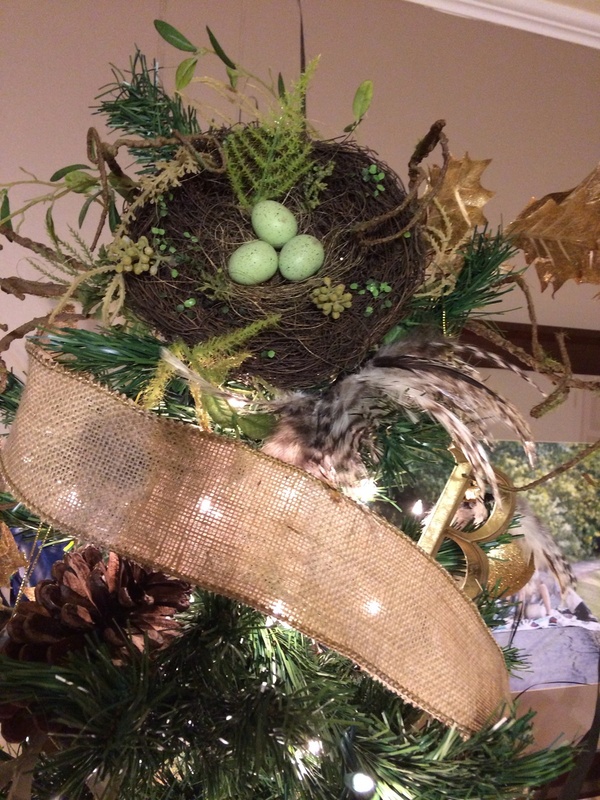 As seen above, I topped our Brood's tree with a nest (given to me by my Mom -- Thanks, Mom!) that normally adorns our entry table. I guess it set the tone for the rest of the tree. Burlap ribbon that I keep on hand for soap packaging wraps the tree, and pine cones that my kids and I scavenged from Mamaw's yard over Thanksgiving (Thanks, Mamaw!) are nestled into the branches. To further the bird theme, I did purchase a yard and a half of this feathered ribbon and gave some of the larger balls on the tree a little makeover. John actually asked me whether they were feathers from our own chickens. If only I were that resourceful! Though, I'm not sure how I would feel about decorating our Christmas tree with the feathers of chickens we've slaughtered in the backyard.